When homebuyers think of North Carolina’s luxury home market, many automatically skip to the coastal regions of the state and the lush beaches and secluded locations that are offered with those spectacular views. However, on the exact opposite side of the Carolinas in the mountains, a completely new breed of luxury homes in North Carolina is offered. On top of mountains with views stretching on for miles, our homes offer a location that is second to none. Taking the gorgeous luxury style of homes, with any and all the amenities you could want as a homebuyer, and placing them into one of the most beautiful and welcoming places along the Appalachian Mountain range, home buyers really cannot ask for more in a luxury vacation home or permanent home. But these mountains come with more than just incredible long-range views that make this location so special and alluring. They offer year round activities that are sure to keep any homebuyer active and their mind engaged. 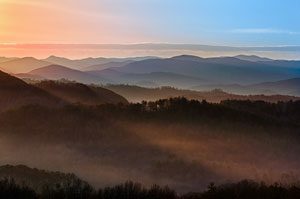 In the summer months you can hike, zip line, visit Grandfather Mountain, have a picnic along the Blue Ridge Parkway, dine at eclectic local restaurants that will surly become a personal favorite, and stroll through the local farmer’s market for freshly grown produce that will take your favorite meal to the next level in flavor and taste! In the fall, the leaves turn bright red, vibrant yellows, and deep oranges that call for multiple photo opportunities throughout the area. The snowy months offer skiing and snowboarding at multiple resorts in the region that anyone can have fun at no matter your skill level. Spring is like no other. Taking a slow drive along the parkway and seeing all of the flowers blooming will remind you of the true beauty of the season. And all of these are just a few activities that are offered in the area. Countless events are held throughout the year and a number of other attractions are in the area just waiting for you and your family and friends to discover them. Just think, all of this could be just minutes away from your new luxury mountain homes!